Team Puzzle Quest - Jon Finkel - D3 Go! Starting today, we would like to introduce a member of #TeamPuzzleQuest or #TeamD3Go! every 2 weeks. These members are sponsored Magic: The Gathering – Puzzle Quest players at Pro Tour events in 2017. Please follow them on Twitter and watch them compete at events via Twitch. Top Pro Tour Results: 3 PT Wins – NY 1998, Worlds 2000, Kuala Lumpur 2008. 16 PT Top 8’s. US National Champion 2000. World Team Champion 1998 and 2000. Magic Invitational winner 2000. Jon’s Go-To Magic: Puzzle Quest Deck For This PW: Welcome to the Fold, Tightening Coils, Disperse, Insidious Will, Glint-Nest Crane, Clash of Wills, Gone Missing, Coralhelm Guide, Wind-Kin Raiders, Prism Array. I’ve always been a control player, so Jace was natural for me. Some of my most mana efficient creatures are in blue, and I back that up with keeping my opponent’s more powerful cards off the board. 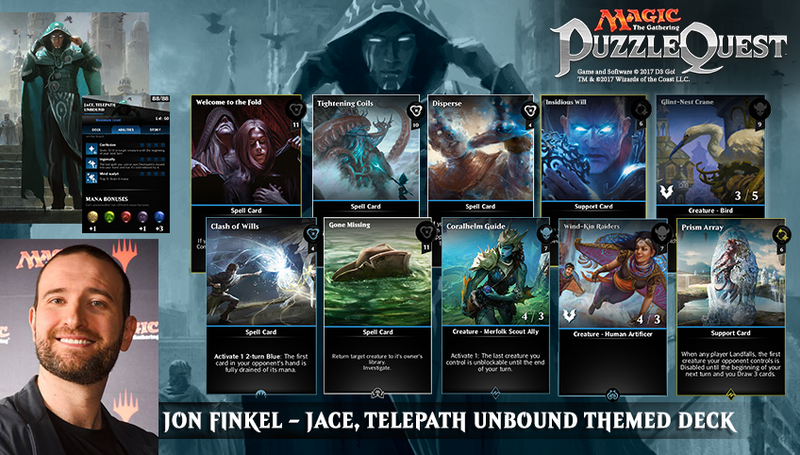 Download Magic: The Gathering – Puzzle Quest HERE for free on the App Store and Google Play!